Composed by Hannah Greene. 21st Century, Contemporary Classical, Modern, Recital. Score. 6 pages. Published by Hannah Greene (S0.70839). 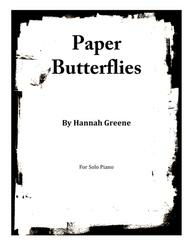 Paper Butterflies (copyright -June 2014)Composer - Hannah GreenePiano - Skylar AndersonPlease visit my website at www.hannahygreene.com- Paper Butterflies is a musical representation of the butterfly craft kids make--- putting paint on one half of a piece of paper and then folding it in half so that the wings of the butterfly are the same on either side. In the same way, the music completely retrogrades half way through the piece. The music beings lightly and grows more dense towards the middle just like the paint that will fill around the folded line of the butterfly. Once again, the music slowly gets lighter toward to end creating a reflection of the piece.The piece is fantastical in nature. Remembering nostalgically the long summer days as a child. .